Lynne Hinkey is a marine scientist by training, a writer by passion, and a curmudgeon by nature. An Olympic-caliber procrastinator, she honed her skill through years of practice and dedication to life on island-time. 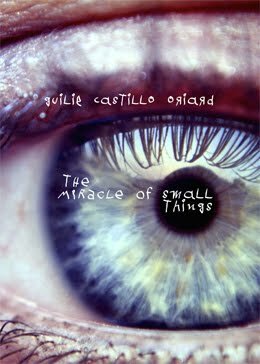 She uses her experiences living in the Caribbean to infuse her novels with tropical magic, from the siren call of the islands to the terror and hysteria caused by the mysterious chupacabra. P.S. from Guilie: And she *loves* dogs. "He really, really likes his job." Huh? I wasn’t sure what that meant. Maybe I was just skeptical of everything this woman said. I'd only come to the "Doggy Psychic" because it was a fundraiser for a dog rescue organization. I happily paid the $25 to sit in a room with this woman for 15 minutes to hear some broad generalizations that could apply to any dog since the money would help other dogs. But this didn't sound like a generalization. For starters, I was pretty sure Muggle didn't have a job. I've had enough terriers and pit bulls to know it's important for some high-energy breeds to have enough physical and mental stimulation so they don't become destructive out of boredom or frustration. Those dogs need a job. Muggle is not that kind of dog. He came to us, a rescue from a kill shelter, with no training. He'd needed some obedience, but otherwise was perfectly content to lie on the sofa all day. "What job is that?" I asked. She sat quietly, eyes closed, one hand on my dog's head. "He really loves that you make him think and learn new things. He sees it as his job." Muggle had entered the room with me only minutes earlier, walked directly to her, and rested his chin in her lap. He'd sat there ever since. After a long moment, she opened her eyes. "You do agility with him, don't you? He's thinking about weave poles." We had just started learning the weave poles in our agility class. When we took our first obedience lesson at the local agility club, I had no intention of ever doing actual agility. Like most people, when I thought of agility I envisioned wild-fast, crazy-smart Border Collies, and brilliant handlers with years of experience who clearly needed infinite free time to train their dogs to do such amazing feats. That wasn't me! Yet here we were, ten months later, doing agility. How did that happen? We went to the local agility club because their obedience classes were at a convenient location. Since they are an agility club, all of their obedience classes include agility foundation skills. So, we learned some basic handling and even a few obstacles like jumps, tunnels, and the boggle board (the start of learning to go over a teeter). Then we kept on learning because we were having fun and becoming a team. Muggle and his trusty biped teammate. Muggle learned obedience commands and how to navigate the obstacles. I learned all about positive reinforcement and the use of shaping. He learned to think and solve problems. I learned how to give him the information he needed and to trust he would do what I asked. He trusted me to reward him for doing what had evidently become his "job." 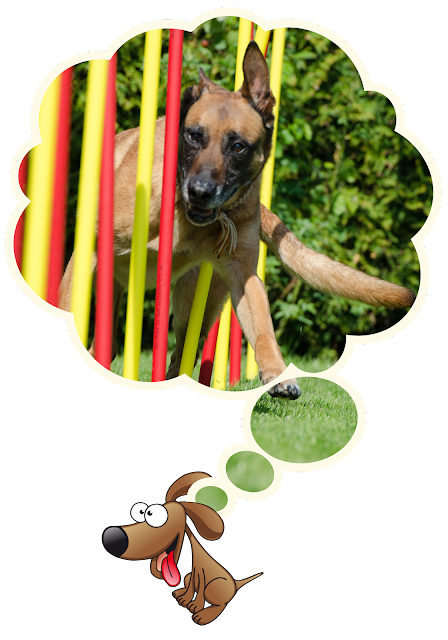 Agility is a great way to go beyond just meeting a (rescue) dog's physical needs of food and shelter, and provide them with mental stimulation. 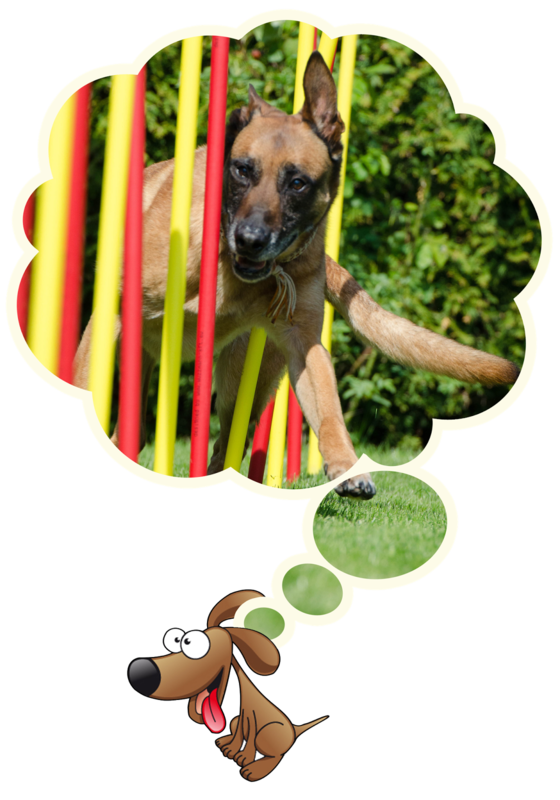 The thinking part of an agility class can use up excess energy more effectively than a long run. It gives dogs a job to do—one that will satisfy them (and you), and leave them fulfilled and tired. Agility builds their confidence and trust in you, and minimizes the difficulties that can come with any new dog, especially rescues that may have unknown trauma in their past. 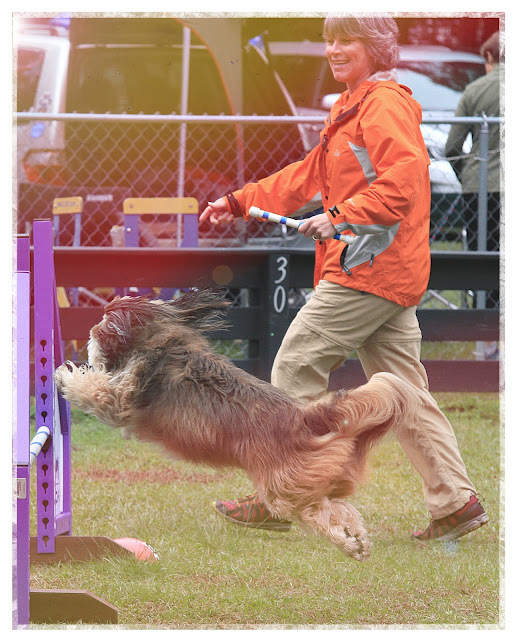 Agility isn't only for Border Collies, Aussies, and herding dogs, and it isn't about winning ribbons and titles (not that those are bad things—we've earned a few ourselves!). First and foremost, it's about spending time with our dogs and the bond that forms and strengthens when we work as a team. Muggle and Lynne. Impossible not to feel the sheer joy here. It's about giving them a sense of achievement. 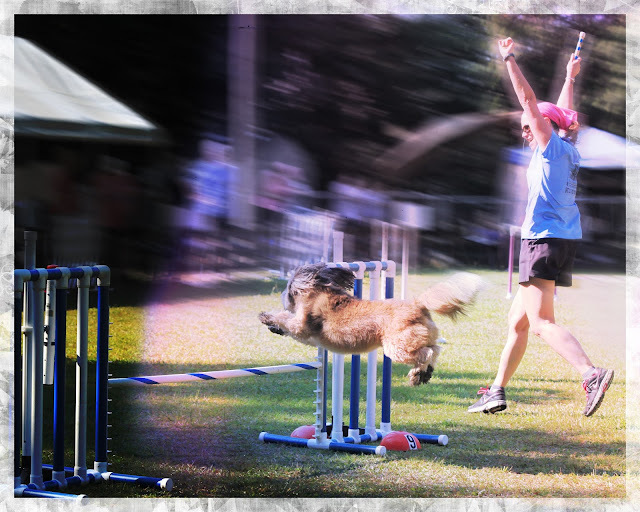 Whether you aspire to compete, or just have fun, agility is a great way to build a strong bond with your dog, rescue or not. It's easy to get started, even if you don't have a local agility or dog sport club. Any dog trainer who uses positive reinforcement, clicker-training, and/or shaping can help with the obedience portion (a simple sit, stay, and down). 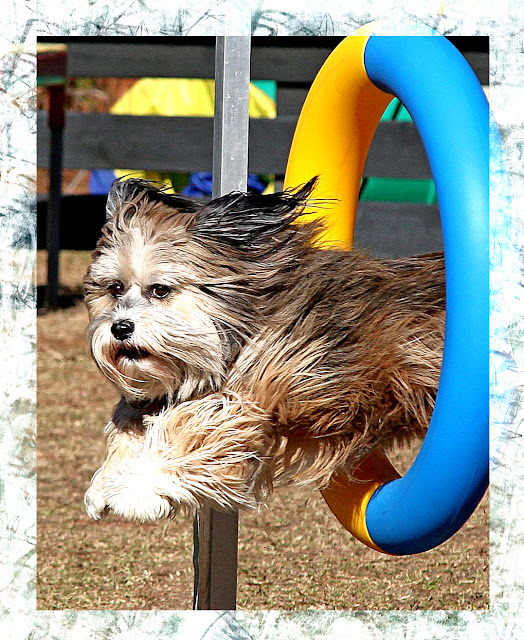 Then you do want to make sure to train your dog to safely perform the obstacles. There are also loads of helpful videos on YouTube to help get you started in your own house or yard. 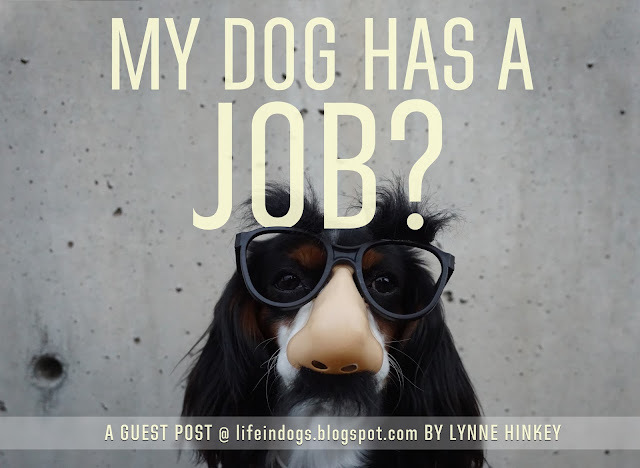 I guarantee, you'll have a lot of fun, and your dog will love his or her new job. 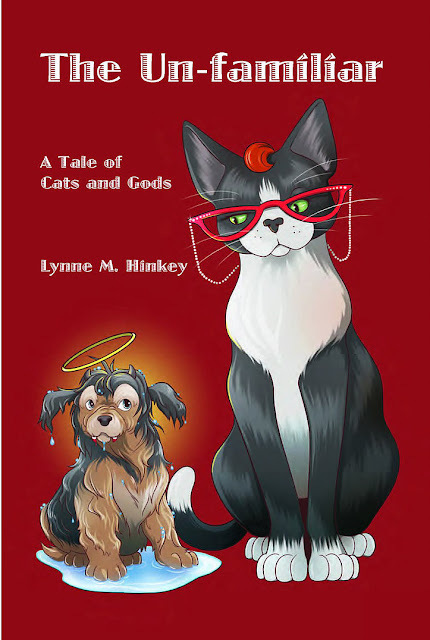 Lynne's short stories and essays have appeared in a number of print and online publications. Her debut novel, Marina Melee, follows George Marshall as he trades in the corporate rat race for life on a tropical island only to find the easy life is hard work. 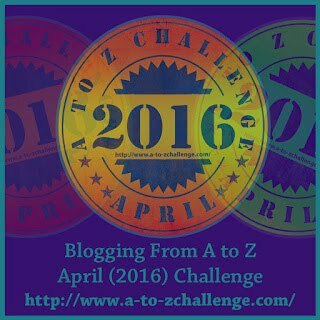 In her second novel, Ye Gods! A Tale of Dogs and Demons, Jack Halliman is looking for a cure to his writer's block but instead finds a dead body and becomes one of two suspects in a murder investigation. The other suspect is the chupacabra. The mythical monster returns in book two of the chupacabra trilogy, The Un-Familiar: A Tale of Cats and Gods. This time, he's brought along some friends—and a few enemies. When not busy writing or procrastinating, Lynne is an adjunct associate professor of biology. She lives in Charleston, SC with her husband, cat, and two dogs, where she is an avid—but not particularly accomplished—agility competitor. You can find all her books at her Amazon author page. Lynne, it was lovely to get your outlook on agility and its benefits for our four-legged friends. I'm one of those who—until very recently—had an entirely wrong idea of what it actually was... But I've since become a convert. You say you're "not particularly accomplished" but, having seen the photos you post on Facebook, I'm your fan. And thank you also for the videos! I've already started working on the left and right one... Will post progress once we get it right (tee-hee). I'd love to know if anyone else has any agility experiences or insights (or questions). Did you watch the videos? Does it look impossible? I know it did to me before we tried it... Let me tell you, it's way way easier than it looks. Well I bought the book. What a great post. I have always wanted to put an agility course in my front pasture. It looks like a great pastime. I may get a bit more serious with the idea. I wonder what my dogs' jobs are. They are our mighty protectors. Thanks for coming by, Ann! Thanks, Ann! I hope you enjoy the book. Please post if you try any agility ideas out. I'm looking forward to hearing how Guilie's efforts to teach her dogs left/right goes. That's one I haven't done with my dogs because I confuse them myself! My mini fox terrier would love agility classes. I love how it seems to give dogs a sense of achievement. My Chihuahua thinks his job is to put the cat to bed at night. We just say the word 'cat' and he bounces around ready to sniff her out. That is so cool, Pinky! Yep, I'm sure he's convinced that's his job — and he's probably real proud of it, too :) It's so sweet how they seem to love the responsibilities we bestow on them, right? I agree; he sounds like the perfect candidate for agility. 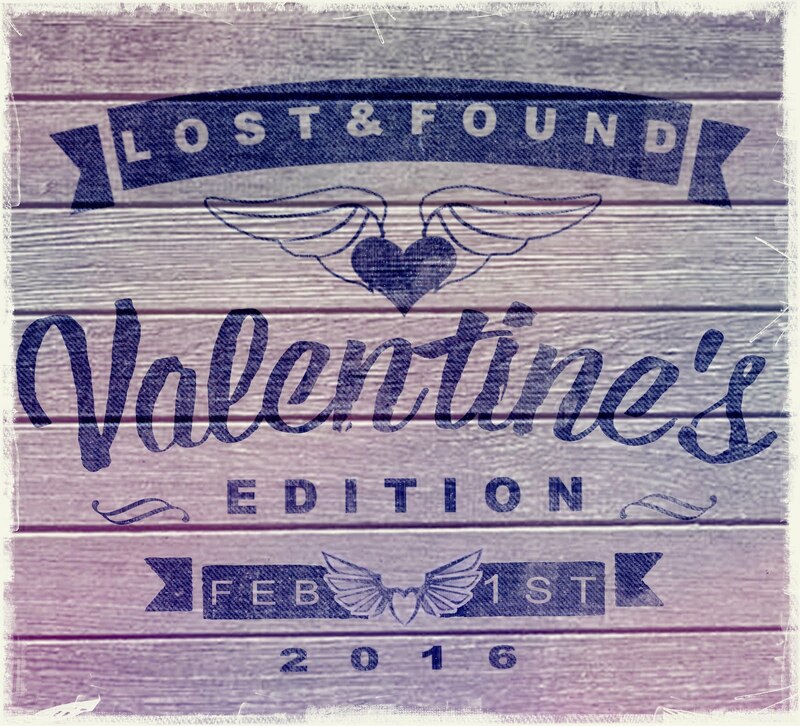 I hope you find a cool place to take him to! Thanks for the visit, and happy start to the week! We have a few fox terriers that compete with us. They're so much fun--all springy and enthusiastic about EVERYTHING! Well, it was worth a shot! We had an Italian Greyhound in class when I started with my second dog, Lupin. When the leash came off, she'd run and run and run until she was worn out, and that was that. No obstacles, no obedience. But gorgeous to watch! Thanks for reading! Me? Read Lynne's books? Mmm, just the Kiki parts.... and the sections in between those. Huge fan and seriously looking forward to the third installment. T Francis Sharp President of the Kiki Cristatello Fan Club. #TeamKiki, huh? I have to say that I'm more in the #TeamMilagros camp, though I wonder what that says about my own dark side... And now, with Un-Familiar, I've totally joined #TeamRafi. Maybe that balances me out? So glad you came by, Tim! Thank you! I love Lynne's writing.It's so weird that a reader can zone in and be transported to another place if the writer is skillful. This is the case with Lynne. Through her eyes, I see another way of life--and I love it. Thank you, Francene. That means a great deal to me! I'm with you, Francene... Lynne has the kind of talent most of us only dream of. What I love most in her writing is the mix of humor and science and fantasy, all wrapped up in murderously good twisty plots, to address serious themes. That takes skill! What a great post, Guilie. Muggle is gorgeous and I'm going to look at those videos because my little Cockerpoo girl is wonderfully agile and I'm sure she'd excel at agility. 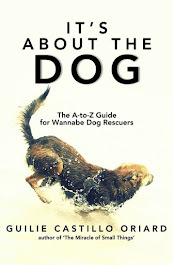 Sounds like a great way to teach your dog, give him exercise and work together as a team. And yes, it even sounds a little bit of fun. Thanks for the visit, Jeffrey! Always a pleasure to see your name pop up in the comments. Dogs are amazing animals, it's amazing all they can learn but even more wonderful is all the love they can give us. I like your post.